Flame of Resistance is one of those books that starts out like a train ride—you know it's going to be a powerful read as it picks up speed through twists and turns to a thrilling ending. It's an intense read from beginning to end, taking place during WWII, in Normandy, France in the momentous and dangerous months just before D-Day. France had been occupied by Nazi Germany for four long years, suffering from fear, mistreatment and food shortages that weigh on the people. Brigitte Durand turns her home into a Germans-only brothel to survive, while anonymously sneaking food to the French Resistance who hide and aid Allied pilots who have been shot down. Brigitte doesn't hesitate when asked to become a spy for the Resistance. She assists the American pilot Tom Jaeger, who poses as a German so that Brigitte can relay to him any information she acquires from the German soldiers who come to her brothel. But even close friends can betray, and Brigitte finds herself in a dangerous mission to rescue the man she loves, risking everything for her friends and country. I've read several books taking place during WWII, but this one focuses on France and gives an inside look at what it was like to be a Resistant agent, risking your life to help others and to fight for your freedom through undercover operations. It was an exciting read, but heartbreaking and terribly sad how they were tortured when discovered. Although Brigitte was a prostitute, one cannot help but admire her inner strength to survive and to anonymously aid the French Resistance. She suffers the harsh disapproval from her own countrymen for her profession, but she dreams of a freed France and does not hesitate when asked to take part in a dangerous mission. I appreciated the author's discretion regarding the scenes that take place at the brothel. 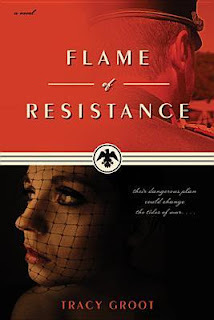 The cast of characters in this novel are memorable, from Michel, one of the great but unassuming leaders of the Resistance sought after by the Germans to Braun, the German engineer who realizes the Nazis are destroying German lives as much as that of the so-called enemy. The author created people that I cared about, that I suffered with, that I rejoiced with. As the story moves to its climax, I was left breathless, wondering how it would all end. The strategy was brilliant and it made me think about how many people during this atrocious time in history had to device plans to escape, survive and fight for justice and freedom. I found this book powerful, emotional and intelligent. It made me appreciate the resilience of the human spirit, the strength of friendship, and the value of loyalty. This is a gripping story, well-written with a tight plot, strong characters, and a memorable setting. Highly recommended! Note: This book is rated V = violence. There are scenes of torture and description of torture in this novel. Disclosure: Thanks to Tyndale House Publishers for sending me this complimentary book for review. I was not compensated in any other way, nor told how to rate or review this product.